There is something kind of surreal about being a long time Jackets fan, and hearing the phrase "the CBJ dropped out of a playoff position for the first time in a year and a half." Nonetheless, an unprecedented run came to an end last night at the hands of the Capitals, and the Blue Jackets are not in playoff position for the first time in a long time. Which, at this stage of the game, is probably healthy. If there were 4 days left in the season instead of a looming trade deadline, it would be time to panic. This, however, is not that time. No matter how poorly they played in January, the CBJ just could not seem to drop out of that third slot in the Metropolitan Division. Now that they are actually showing signs that they can play hockey, they can't seem to win. I think it will come though, as they are actually starting to forecheck effectively. So we will see what happens tonight against the Devils. The Jackets have a run of Metro teams to try to handle here in February, so this is a good time to try to win some games. One of the excuses for not bringing your best just went away though. Now that they are looking up at playoff position, it shouldn't be too hard to get motivated. 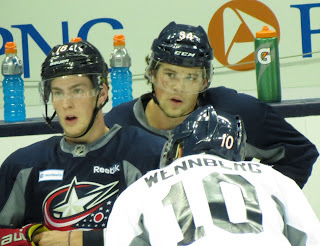 The veteran core is showing signs of life, and Atkinson looks like he is getting ready to get hot and start scoring. We will see if that pans out. The games matter from here on out, which should make for some compelling hockey. I'm looking forward to watching these games down the stretch. It should be fun.